If you’ve noticed that your horse is coughing, sneezing or showing signs that could suggest his respiratory system is in need of a little help, this is the blog for you. Here, we’ll look at ways to help support the horse’s respiratory system. Assess the situation. The horse’s respiratory system is pretty sensitive and if you’re in any doubt as to what’s ‘wrong’ with your horse, it’s always best to call the vet. Is it dusty in here? Dust in the stable environment can come from hay, bedding or just ‘old’ dust and dirt in the stables. If your horse spends a lot of time inside and he’s struggling with the dust levels, consider steaming or soaking your hay and switching to a dust free bedding. Keep in mind that it’s not just your hay and bedding that matters. If your horse is stabled in a barn with other horses, their dusty bedding or hay could also have an impact on your horse’s respiratory system. Ammonia. 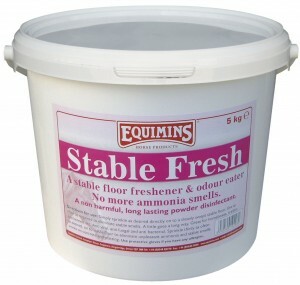 Ammonia is that eye watering aroma that’s fairly common in stables, but apart from being pretty horrible, it can also compromise the horse’s respiratory system. Keeping the horse’s bed clean, using a bedding to suppress the ammonia and using a product like Stable Fresh can all help. Stable Fresh is a dry disinfectant powder that’s anti viral, anti fungal, anti bacterial and removes the smell of ammonia when used correctly. Turn out. Turning your horse out removes him from a potentially dusty environment and has a lot of other benefits too. If you don’t have all weather turnout, make sure he’s at least removed from the stable area when you’re mucking out, even if this means putting him in an indoor/outdoor arena for a while. Moving bedding around next to a horse with a respiratory issue isn’t advisable. Feed from the floor. Horses are designed to eat from the floor and feeding in this way can actually help support airway drainage. Add a supplement. 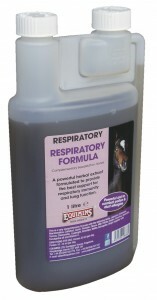 There are a number of supplements that have been created to help support the respiratory system. These come in the form of liquid (like our Respiratory Formula), powder (like our Clear Breather) or dried herbal blends (like Air-Way Herbs). If you need any additional advice on supplements to support respiratory health, please get in touch.